Sharon Kinney on SAS: No Longer Shooting Darts in the Dark! The most difficult decision, after you commit to a conference or workshop, is selecting what you will attend. Often I choose by content courses that will fill a niche need, but sometimes my choices are governed by the presenter. Every time I see Sharon Kinney’s name on anything, I’m in, because I know the session will be packed with pain-free information and I will have a lot of fun learning. A seasoned presenter, Sharon creates a dynamic, interactive, and always intelligent session. She is known for taking the often deadly dull and boring topics that she is “assigned” to cover and makes them an electric and engaging experience. So it was when we packed a room full to learn about our future and the changing process of teaching and learning with our students in PA.
On the opening day of LCTIs Teaching and Learning in Today’s World: Lessons from The Field, Sharon Kinney, Staff Development Facilitator at Lehigh-Carbon Intermediate Unit 21 gave an insightful, interactive, and fun workshop called SAS: No Longer Shooting Darts in the Dark, explaining the Commonwealth’s Standards Aligned System. Four years ago, the original Literacy Committee in Harrisburg knew that the “Race to the Top” funding was the proverbial train we all had to get on because funding is tied into it. Each state was given the opportunity to develop goals and plans for the future, with the top running states getting the most money. Pennsylvania put all its money into one place: SAS. Speaking rhetorically, Sharon asked is school districts had tho option to say no to SAS, and the answer, of course is yes, but if a district does not participate, it does not get funding. Our afternoon session was a pain-free exploration of PDE’s Standards Aligned System. And here is the most important message that Sharon delivered: SAS is PAs attempt to level the language playing field. SAS is PAs program to put ALL school districts on the same page, with a common language so we can converse, collaborate, and teach using a common framework that is language consistent. SAS is the “architecture” for one system, one philosphy that suports intervention and aids teachers in creating student achievement for all students. Once you understand this very simple basic, you understand that whatever SAS offers, you are most likely already doing it, just by a different name. 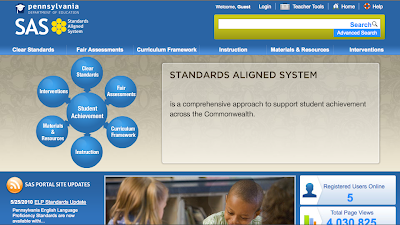 Descriptions of anchors, eligible content and standards exist for each of the 6 elements. Clear Standards describe what students should know and be able to do; they increase in complexity and sophistication as students progress through school. Fair Assessment is “a process used by teachers and students before, during, and after instruction to provide feedback and adjust ongoing teaching and learning to improve student achievement.” The key language in this component is feedback, and it needs to be ongoing and uniquely targeted to remediation for student needs. The Curriculum Framework specifies what is to be taught for each subject in the curriculum. 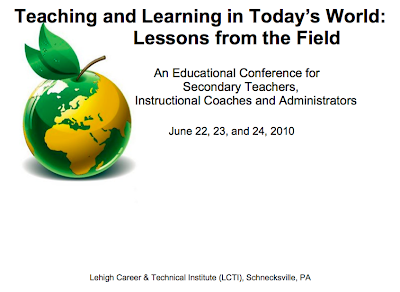 In Pennsylvania, Curriculum Frameworks include Big Ideas (transcend grade levels; think overarching Essential Question from Reading Apprenticeship), Concepts (what students should know), Competencies (what students should be able to do), and Essential Questions (student inquiry, critical thinking) aligned to Standards and Assessment Anchors and, where appropriate, Eligible Content. Instruction aligns with Standards. Material and Resources incorporate “learning progressions, units, lesson plans, and content resources” aligned with Standards, and the good news is that when complete, 0ver 30,000 lesson plans will be uploaded to the SAS site for the 4 core subjects. Interventions ensure that students meet and exceed grade level Standards. 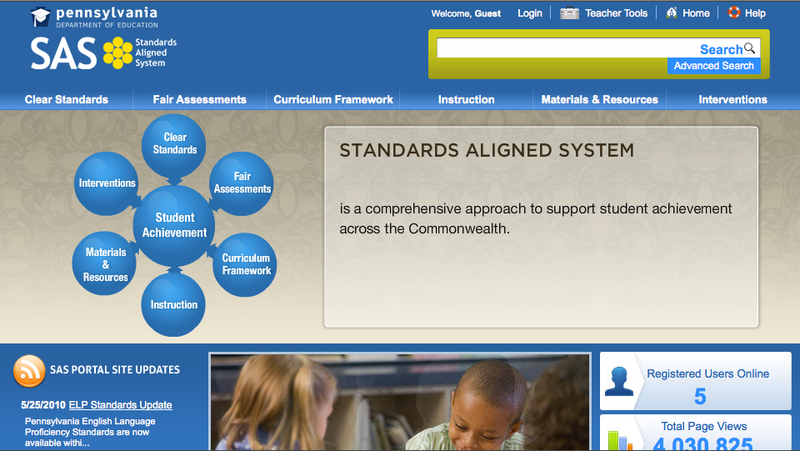 You might want to peruse this page because very articulated interventions are in place to guarantee student success. What I like about SAS is the wealth of resources that are already available in some of the core subjects, especially math. While something new seems daunting, my suggestion is that you create your account and begin browsing your areas of instruction. I began to panic when I did not find much in my discipline, but Sharon assured me that in the next month, the site would begin to explode with lesson plans. Just in case you want to get a head start on surfing SAS and planning for next year, or if you want to check out the resources PDE is uploading weekly, here are easy steps to creating and navigating an SAS Account, compliments of Sharon’s handout. I wish I could provide screen shots, but I established my account in May. Click the Join Now link. Enter your First Name, Last Name and Professional Email address. Enter a Password, and then Confirm the new Password by typing it again. Passwords must contain at least 6 characters (numbers or letters). Once registered, your Name should appear in the upper-right hand corner of the page. To log in to SAS, click the Login link or click the Sign in here link. Type your Email Address and Password and click Submit. You’re in, and a wealth of resources awaits. Check out PDEs video. RJ, THANK YOU SO MUCH for your positiveness! You gave me more credit than I deserve. YOU, and the others in the group, brought a great mind, a willingness to listen/learn, and a desire to take information in a direction that will help students!!! My hats off to you and the rest of the group. SAS can only be as good as the teachers who implement it. Hopefully, they will al be as GREAT!as you are… Keep the learning going – our students need you!! !